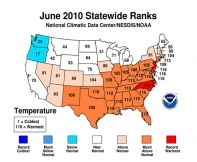 Commerce's National Oceanic and Atmospheric Administration (NOAA) reports that several warm periods across the contiguous U.S. during April brought the national average temperature to 55°F, 3.6°F above average, marking the third warmest April on record. These temperatures, when added with the first quarter and previous 11 months, calculate to the warmest year-to-date and 12-month periods since recordkeeping began in 1895. January-April was the warmest such period on record for the contiguous United States, with an average temperature of 45.4°F, 5.4°F above the long-term average. 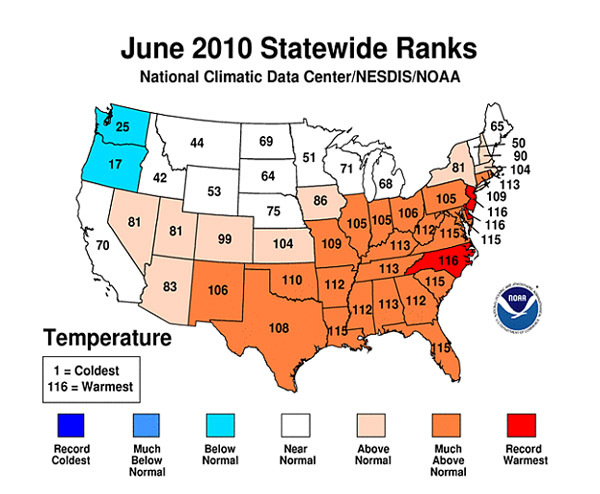 Twenty-six states, all east of the Rockies, were record warm for the four-month period and an additional 17 states had temperatures for the period among their ten warmest.